Kayobe is a free and open source deployment tool for containerised OpenStack control planes, based on Kolla and Kolla-Ansible, and embodying current best practices. Kayobe is seeing broad adoption for research computing configurations and use cases. After its beginnings with OpenStack Ocata, Kayobe is now onto its fourth major OpenStack release with support for Rocky. Admittedly, Rocky was finalised back in November 2018. StackHPC's dedicated team (who drive much of the work on Kayobe) have been busy with some major pieces of work, both within StackHPC and around the OpenStack ecosystem. Thanks to growing strength and breadth, the team was actually quicker with this release than it was with Queens, and expects to be quicker still with the forthcoming Stein release. In addition to support for deploying and managing Rocky, the release notes describe many new features in this release. Mark Goddard presented our work on Kayobe at the recent UKRI Cloud Workshop at the Francis Crick Institute in London. Mark says, "The Kayobe 5.0.0 release includes a number of useful features. We now have a full upgrade path for the seed services from Ocata to Rocky. The Python package now includes the Ansible playbooks, meaning that you can now use Kayobe without a copy of the source code repository. This sets us up for more reproducible and easy to install Kayobe control host environments. Thanks to everyone who contributed to the release. Now onto Stein - get in touch via #openstack-kayobe or the openstack-discuss mailing list to help shape the next release!" 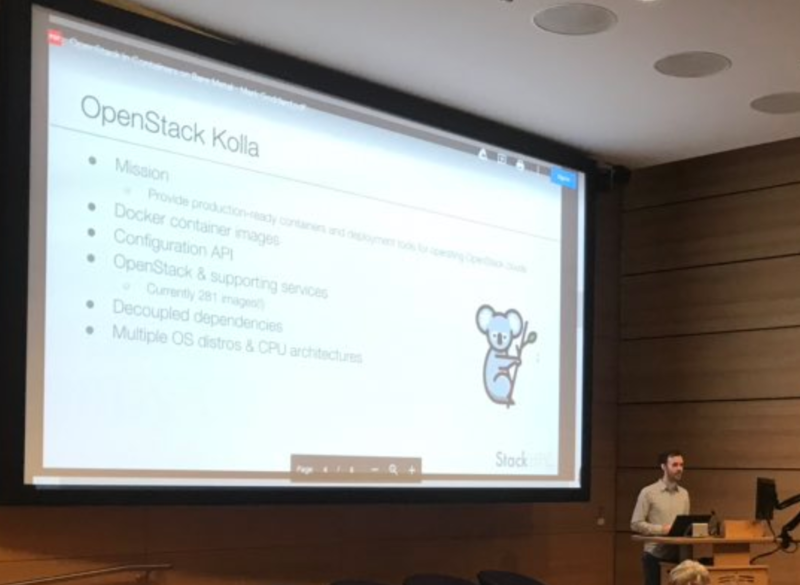 A movement to build greater community around users of OpenStack for scientific computing being spearheaded by a consortium of UK research institutions.